Ultimately, we all choose to live long and healthy lives with minimal health issues. We are constantly being impacted by fads that are sparked via media and contemporary science. There is a plethora of information out there and it is hard to distinguish truth from illusion, not knowing what twisted motives individuals and organisations have that create further confusion in the name of profit. The food that we eat is not protected from this confusion, especially when it comes to the organic vs ‘conventionally grown’ food debate. Some people are either sitting on the fence or either side holding their stance staunchly with a naïve stubbornness. Those with clarity and understanding can see why we have shifted to a chemical fueled agricultural system and why we are now inevitably moving back to low impact techniques which re-balances the homeostasis of our planet, our food and ourselves. 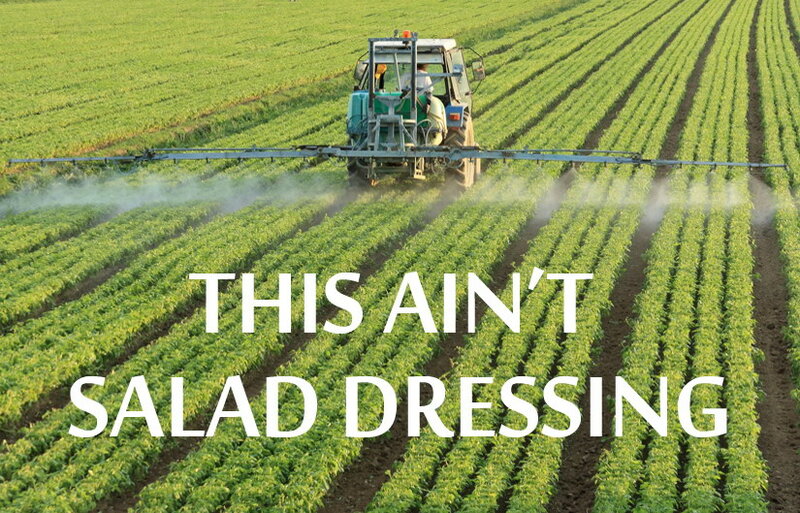 In this article we are exclusively looking at the use of pesticides in farming. Articles in the future will address the other differences between farming methods including: antibiotics, hormones, irradiation and genetic modifications. Organic farming: an approach to raising livestock and producing crops that doesn’t use synthetic chemicals, hormones, antibiotic agents, genetic engineering and irradiation (1). Biodynamic farming: a holistic approach where individuals consider every aspect of farming, from how the land is owned and capitalised to how the food is produced, distributed and prepared, recognising the planet as a single, self-regulating, multi-dimensional system (2). Conventional farming: highly intensive, targeting single crops on the same lot, season after season, utilising pesticides and fertilisers combined with energy intensive technologies (3). Pesticide: any substance or mixture of substances used to destroy, suppress or alter the life cycle of a pest. They can be synthetically produced or naturally derived, including organisms. Pesticides include herbicides, fungicides, insecticides, fumigants, bactericides, rodenticides, baits, lures and repellents (4). Pesticide use has occurred for thousands of years with civilisations using poisonous plants to protect their crops to increase their yield. Over the years it changed from natural occurring sources to engineered chemical compounds like organochlorines and pyrethin. The increase of use occurred after the famines of World War II, at a time when global powers needed to ensure food security (5). Since then we have had increased farming yields and increases in pesticide use with one million tonnes being dispersed annually (6). This growth though has had significant effects on the world’s ecosystems, having a major role in world pollution, as the demand for food increases due to the growing human population (7). How are Pesticides Regulated in Australia? Pesticide use is regulated under the National Registration Scheme (NRS), which is a partnership between state and federal government. Australian Pesticides and Veterinary Medicines Authority (APVMA) is responsible for what products can be used in Australia, up to and including the point of sale. The actual use of the pesticides is regulated by the states themselves (8). Gaps in our legislation and the rush to minimise red tape by APVMA over pesticide use can only results in us finding out about the long term risks after we have already been exposed. Without stable ecosystems in the world, we as a species won’t be able to survive. It is clear that the way we farm has direct links to the ecosystems and when we increase the toxicity of those systems and create a homeostatic imbalance, it throws our world into turmoil, directly affecting all species survival. What impacts are there on the food? Less well known is the impact of organic vs conventionally grown farming techniques on the food itself. Although conventionally grown food will carry with it the residue of the pesticide that we consume (15), the current science isn’t completely clear on effects on the food (16). Some studies have shown links to higher Vitamin C and lower Nitrate levels (17) and obviously lower toxicity but further studies need to be conducted to control factors like climate, plant maturity at harvest and location, etc. to get a greater understanding. The cocktail effect of mixing chemicals in the agricultural process having a build-up effect, especially when looking at the effects of Roundup at non-toxic levels on endocrine cells as well as affecting the estrogen cells that are responsible for foetal development in pregnant women (19, 20). Glyphosate (primarily used in Roundup) has been shown to inhibit enzymes that have a crucial role in breaking down foreign substances, creating a build-up effect and linking to gastrointestinal disorders, obesity, diabetes, heart disease, depression, autism, infertility, cancer and Alzheimer’s disease (21). It is important to note, all these studies are looking at pesticides that ARE permitted currently in Australia, with Glyphosate restrictions around waterways and Chlorpyrifos currently under review by APVMA. When you look at the true cost of buying conventionally grown food on a holistic scale, as has been evidenced in this article, we can no longer ignore our moral obligation to choose a healthier and more sustainable way of producing our food. Note: Organic doesn’t mean pesticide free. Try to purchase organic/biodynamic and pesticide free where possible. From the research that has been shown, there is growing data on the effects of conventional farming methods on the planet, the food produced and our individual health. Over time the science will become clearer and the world will learn to accept that there are negative side effects to our current conventional farming techniques that are no longer ok for the world we live in today. You can’t always eat organic and we aren’t encouraging a strict regime that limits your ability to engage with the community around you. Merely this work is aimed to allow you to make more consciously aware decisions on the effects to your health and the world around you. As the science behind eating organically becomes clearer, the rest of the world will start to shift too. In the future we will expand the understanding of the impacts on organic food vs non-organic and look at the impacts of the use of antibiotics, hormones, genetic modification and irradiation and the effects it has on the food, the planet and ourselves. 1. Forman J, Silverstein J. Organic Foods: Health and Environmental Advantages and Disadvantages. PEDIATRICS. 2012;130(5):e1406-e1415. 6. Berton T, Mayhoub F, Chardon K, Duca R, Lestremau F, Bach V et al. Development of an analytical strategy based on MS/MS for the measurement of different classes of pesticides and theirs metabolites in meconium: Application and characterisation of foetal exposure in France. Environmental Research. 2014;132:311-320. 7. Yu-Chen Lin A, Tzy-Ying Huang S, Wahlqvist M. Waste management to improve food safety and security for health advancement. Asia Pacific Journal of Clinical Nutrition. 2015;18(4):538-545. 10. Vorley W. Impact of pesticides on farmer health and the rice environment. Field Crops Research. 1997;54(1):73-74. 11. Productivity Commission, 2008. Chemicals and Plasitics Regulation, Research Project. Melbourne; 2015. 12. King J, Alexander F, Brodie J. Regulation of pesticides in Australia: The Great Barrier Reef as a case study for evaluating effectiveness. Agriculture, Ecosystems & Environment. 2013;180:54-67. 13. Blumberg B. Endocrine Disruption: Biological Bases for Health Effects in Wildlife and Humans. Q REV BIOL. 2007;82(4):437-438. 14. Bergman Ã…, Heindel J, Kasten T, Kidd K, Jobling S, Neira M et al. The Impact of Endocrine Disruption: A Consensus Statement on the State of the Science. Environ Health Perspect. 2013;121(4):a104-a106. 15. Huber M, RembiaÅ‚kowska E, Åšrednicka D, BÃgel S, van de Vijver L. Organic food and impact on human health: Assessing the status quo and prospects of research. NJAS - Wageningen Journal of Life Sciences. 2011;58(3-4):103-109. 16. Seufert V, Ramankutty N, Foley J. Comparing the yields of organic and conventional agriculture. Nature. 2012;485(7397):229-232. 17. Williams C. Nutritional quality of organic food: shades of grey or shades of green?. Proceedings of the Nutrition Society. 2002;61(01):19-24. 18. Vogt R, Bennett D, Cassady D, Frost J, Ritz B, Hertz-Picciotto I. Cancer and non-cancer health effects from food contaminant exposures for children and adults in California: a risk assessment. Environmental Health. 2012;11(1):83. 19. Benachour N, Sipahutar H, Moslemi S, Gasnier C, Travert C, Sralini G. Time- and Dose-Dependent Effects of Roundup on Human Embryonic and Placental Cells. Arch Environ Contam Toxicol. 2007;53(1):126-133. 20. Wickerham E, Lozoff B, Shao J, Kaciroti N, Xia Y, Meeker J. Reduced birth weight in relation to pesticide mixtures detected in cord blood of full-term infants. Environment International. 2012;47:80-85. 21. Samsel A, Seneff S. Glyphosates Suppression of Cytochrome P450 Enzymes and Amino Acid Biosynthesis by the Gut Microbiome: Pathways to Modern Diseases. Entropy. 2013;15(4):1416-1463. 22. Rauh V, Arunajadai S, Horton M, Perera F, Hoepner L, Barr D et al. Seven-Year Neurodevelopmental Scores and Prenatal Exposure to Chlorpyrifos, a Common Agricultural Pesticide. Environ Health Perspect. 2011;119(8):1196-1201. 23. Fanaroff A. Brain anomalies in children exposed prenatally to a common organophosphate pesticide. Yearbook of Neonatal and Perinatal Medicine. 2012;2012:45-46. Older PostMetabolic Eating Plan Recipes!